62" 58# Osage selfbow, river-cane arrows with sinew wrapped trade points. 7yd shot, started out to be a 60yd recovery, then she decided at the last second to dive off a STEEP bluff. She was dead before she hit the ground! But I must say that ALL of the meat is good & tender now! Beautiful bow, beautiful doe--thanks for sharing! Excellent job Richard,sweet lookin bow!! pretty deer and good lookin',sensible rig you got there too, Flat! 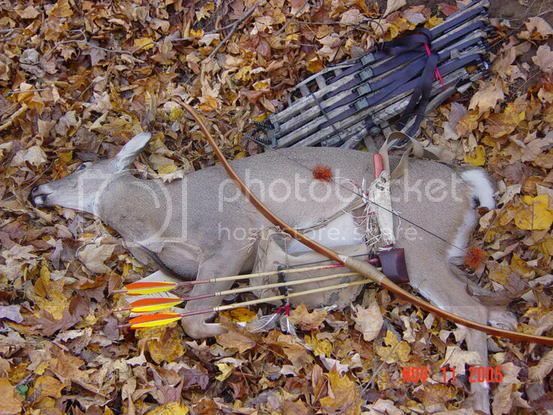 Excellent picture congratulations on the selfbow kill (you make that?). Thats some pretty cane ya got there too.